Libre software is changing the way applications are built by companies, while the traditional software development model does not pay attention to external contributions, libre software products developed by companies benefit from them. These external contributions are promoted creating communities around the project and will help the company to create a superior product with a lower cost than possible for traditional competitors. The company in exchange offers the product free to use under a libre software license. Android is one of these products, it was created by Google a couple of years ago and it follows a single vendor strategy. As Dirk Riehle introduced some time ago it is a kind of a economic paradox that a company can earn money making its product available for free as open source. But companies are not NGOs, they don’t give away money without expecting something in return, so where is the trick? As a libre software project Android did not start from scratch, it uses software that would be unavailable for non-libre projects. Besides that, it has a community of external stakeholders that improve and test the latest version published, help to create new features and fix errors. It is true that Android is not a project driven by a community but driven by a single vendor, and Google does it in a very restricted way. For instance external developers have to sign a Grant of Copyright License and they do not even have a roadmap, Google publish the code after every release so there are big intervals of time where external developers do not have access to the latest code. Even with these barriers there are a significant part of the code that is being provided from external people, it is done directly for the project or reused from common dependencies (GIT provides ways to reuse changes done to remote repositories). 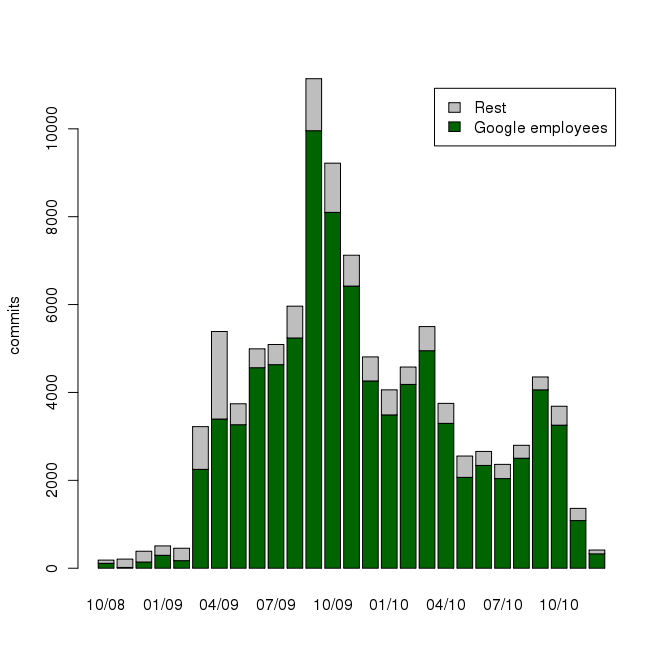 The figures above reflect the monthly number of commits done by people split up in two, in green colour commits from mail domains google.com or android.com, the study assumes that these persons are Google employees. On the other hand in grey colour the rest of commits done by other mail domains, these ones belong to different companies or volunteers. According to the first figure (on the left), which shows the proportion of commits, during the first months that were very active (March and April 2009) the number of commits from external contributors was similar to the commits done by Google staff. 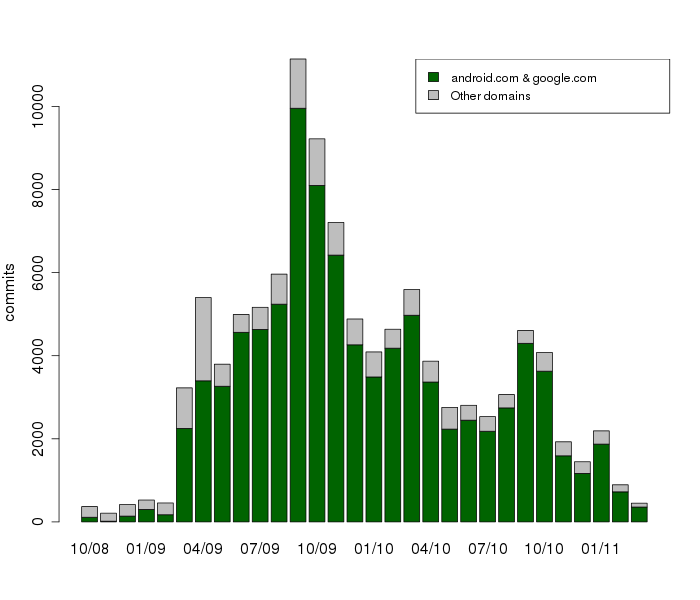 The number of external commits is also big in October 2009, when the total amount of commits reached its maximum. Since April 2009 the monthly activity of the external contributors seems to be between 10% and 15%. 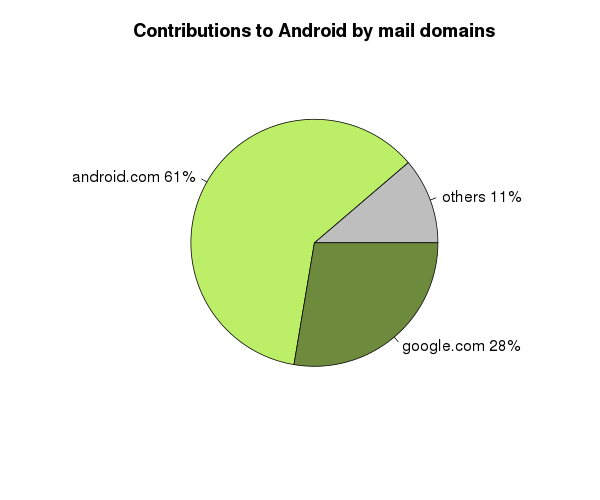 More than 10% of the commits used by Google in Android were committed using mail domains different to google.com or android.com. At this point the question is: who did it? This study is a ongoing process that should become a scientific paper, if you have feedback please let me know. CVSAnalY was used to get data from 171 GIT repositories (the Linux kernel was not included). Our tool allow us to store the metadata of all the repositories in one SQL database, which helped a lot. 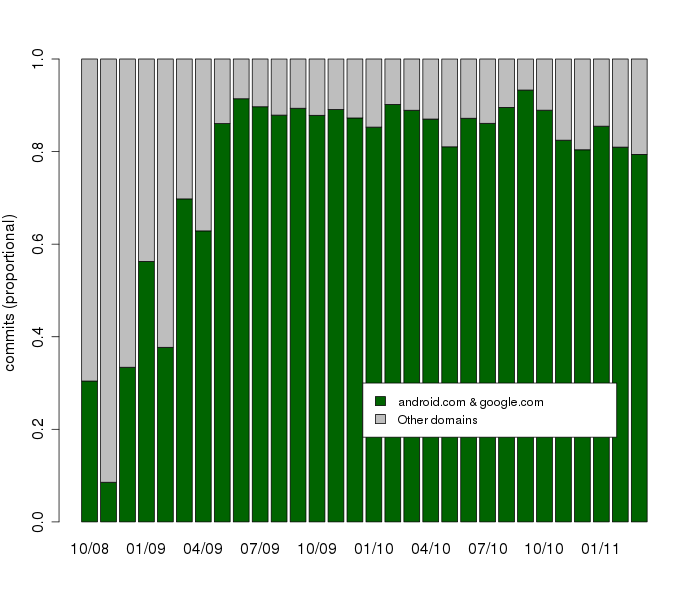 The study assumes that people working for Google use a domain @google.com or @android.com. One of my targets for 2011 is to make as easy as possible the process of obtaining quantitative data from open source projects. We have developed several tools with that purpose but they still need a lot of love to be really user-friendly and stable. In the following two posts I’ll show you how to get basic data from FLOSS projects using the source code repository, in this example we will study the code provided by Android using cvsanaly to get data from the repositories and R to create a couple of charts. The Google developers created a tool called repo to deal with the different git repos that they are using in Android. I don’t like to install tools that I won’t use so I’ll bypass it with a couple of bash commands. The XML code above only shows some of the 159 references to git repositories. Without the repo command created by Google, the developers should have to download them one by one or using a script. We will use awk and a simple bash script to extract them form the XML file and download them in one go. Now, just edit the file get_repos.sh and add the following lines at the beginning and we have a script to download the Android’s repositories. Don’t forget to give it execution permission. At this point you are ready to start playing with the raw data extracted from all the git repositories in a single relational database. Stay tuned, the second chapter is coming soon.